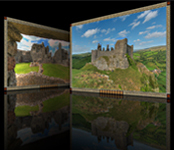 One of the most spectacular sites in Wales is Castell Carreg Cennen, located a few miles southeast of Llandeilo. Spellbinding views await from the hilltop upon which the castle sits, if you're up for an invigorating climb. Imagine yourself an invader, intent on the overthrow and ruin of the castle, as you hike towards the hilltop. Breathtaking views of the beautiful Welsh countryside await as the spoils of your conquest.